Most new beehives are started by ordering a package of live honey bees, usually in the three pound size. Below is a list of reputable resources we’ve compiled. This is in no way a complete list of bee suppliers. You might also reference the Northern Bee Network site for a list of suppliers. Chris Barnes at Dadant & Sons (Albion, MI) Chris offers bees from California; phone: (517) 629-2860. Don Lam Bees (Holland, MI)Don brings in thousands of packages from Gardner’s Apiaries in Georgia for beekeepers in West Michigan, available for pick-up in Holland MI in late April and early May. Steller Apiaries (Marshall, Michigan) Offers package bees and also specializes in top bar hives and alternative beekeeping methods. 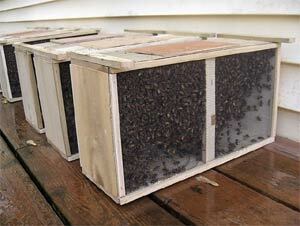 Wilbank Apiaries (Benton Harbor, MI) Contact Paul at 269-277-1759.